This boy has serious talent. Channeling the power of Elton John, Billy Joel (a frequently covered personal favourite of his) and Rufus “Cigarettes & Chocolate Milk” Wainwright, Adrian gives this everything. No wonder he’s signed to Universal Music Hong Kong – not only does he have the chops, he’s got the songs and the delivery. Oh and the looks as well – he’s charmingly nerdy in his flat cap and white glasses. And don’t let anyone tell you that piano can’t rock! Well, there’s no way you can really stop them saying it, as it’s impossible to guess what people are going to randomly say to you, but if they do say that, you can tell them how wrong they are. At times Adrian seems to transcend his piano, it’s such a huge noise he produces. It’s hypnotic as well – all you can do is stand transfixed while he simultaneously charms and besieges you with his wonderful music. In several languages as well. It’s tricky enough to work out what he’s singing in English, but it’s totally mystifying in Cantonese and Mandarin. But who cares? He could be crooning the phone book, it doesn’t matter – once he hits you with that rich, sonorous voice you just start smiling and nodding vacuously, like a Castle Peak escapee on a musical mission. Although he only performed only three tracks: two originals (無非一聲掰拜, 路…一直都在) and a cover – an impassioned version of Hozier’s anthem against homophobia “Take Me To Church” – this felt very much like a ‘proper’ show, from a consummate showman – nice work Adrian! If you shut your eyes, you would swear you were back in time with Elton John crooning to you during the 70’s. You open your eyes and who do you see? 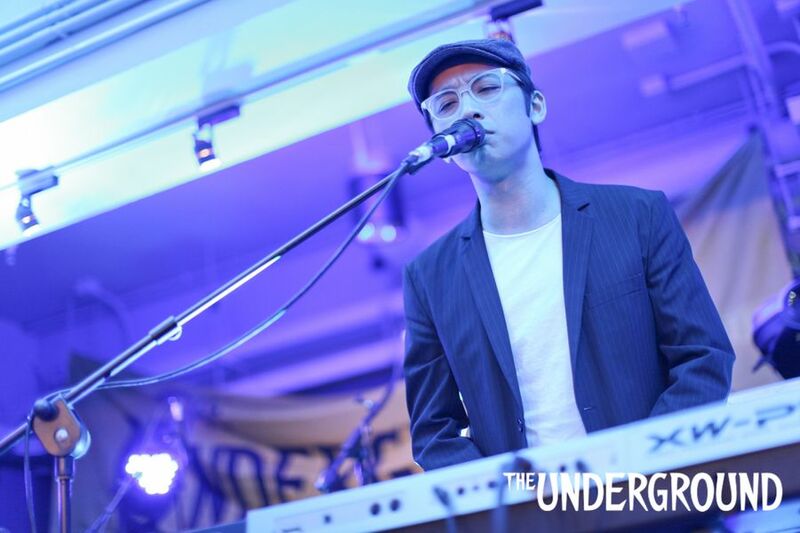 Adrian Fu on keyboards, entertaining the crowd with his voice, playing and easy-going banter. He sings passionately with a good voice, although there were times he was straining to hit the high notes which was more noticeable on the first few tracks, perhaps his voice had warmed up after that. Unable to understand Putonghua, I can only comment that 終點之外 is exactly how I imagine Billy Joel would sound like if he sang in Putonghua. I personally am not a fan of Crowded House, although the crowd seemed to be singing along. “Good Morning Hard City”, the intro reminded me of Air Supply (maybe this is not a good thing). The new demo “Please Walk Away” didn’t have enough hooks to keep my attention (unlike Good Morning Hard City). Clearly Adrian is a friend of Chris B, as she got to choose whether he covered Billy Joel or Elton John. Luckily she chose Billy Joel. A nice way to kick of the evening.